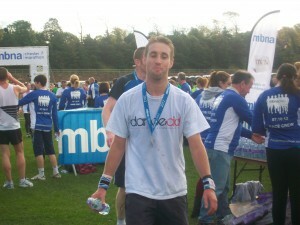 Matt Barber after completing the 2012 Chester marathon for danceaid! After another awesome day of exhilarating sporting action (followed by a great night out in Birmingham after) representing my company in a charity football competition organised by danceaid, I recall being astounded and touched at how brilliantly danceaid’s representatives conducted themselves throughout the whole event. It was nothing short of humbling to see people working with a huge grin on their face, for such a selfless cause and not only that but the manner in which they went about encouraging people all day and thanking us wholeheartedly, simply for our participation in the event, frankly (and quite rightly!!) caused me to feel like a total fraud. The quite surreal nature of this experience struck me profoundly! I had been given the day off work (paid) to play football and basically enjoy myself and these people were stood in front of me telling me how brilliant I was for doing so, while in stark contrast they were giving up their time, unpaid to raise money for disadvantaged children they have never even met who are suffering through no fault of their own! I decided the best way for me to show my appreciation for Danceaids efforts and acknowledge their honourable cause (not to mention ease my conscience!) was to take on a genuinely exhausting & time consuming physical challenge of my own to raise money for the great cause Danceaid represent, so I began training for the Chester full marathon. I wanted to really raise the bar by knocking a minimum of 1 minute per mile off my last time when attempting the Chester run, giving me an initial target time of 4hrs 15 minutes. Just to spice things up and motivate me further I committed myself to knocking 5 minutes off my target time for every £100 raised before a certain date, meaning by the time I actually started the race I had been set a new target of 3 hrs. 55 mins! With a forfeit of paying a further £100 to the total raised if I failed. I trained hard for 15 weeks this time and stuck rigidly to a tough training schedule which involved three 5 mile runs a week increasing to 4 at times with long Sunday runs peaking at 21 miles including some additional sat runs too. from the word go I found a comfortable natural speed for me was around 8 minute miles (even when just doing 2 miles to start with) so I set myself the goal of trying to maintain this speed for all of my training distances however far they were. Throughout the 15 weeks I took one complete week off midway through which I felt guilty about initially but I feel ultimately it spurred me on through the tougher weeks that followed it. For anyone thinking of running one I would say this: – Make a realistic assessment of your base level of fitness and get a training schedule and target time that is achievable and stick to it! The toughest part of this challenge is not the race itself but the months of disciplined training it requires. Not going the pub on a Saturday night and getting up at 6:30 am on a Sunday to do a 20 mile training run in the rain is the big challenge!!! That said; don’t under estimate the psychological side of it. If you’re losing motivation treat yourself! the night before one of my longest training runs, just as I was starting to feel the pressure of the race looming I went out for a meal with friends and had 3 pints but because I had a great night I woke up feeling ready for the challenge and did my best time for a 20 mile run rather than having stayed in, slept badly and worried myself with negative thoughts. On the big day I hardly slept a wink due to nerves and the drunken people of Chester outside my Travelodge window. This wasn’t an issue really however as I was so keen to just get started, that the lack of sleep was the last thing on my mind. It was a perfect day weather wise and the support throughout the whole race was tremendous, wearing the Danceaid colours with pride and hearing people shouting my name was utterly inspiring! I really fed off the crowds of people cheering me on and shouting my name. After completing one of the toughest physical challenges there is and knowing I had done it for such a good cause was a genuinely life changing experience and one I would strongly recommend to anyone reading this. If you want to take part in a truly inspirational physical event why not do it for Danceaid and turn a great personal achievement into a life changing event for someone far less privileged than you. Make a choice to do something amazing today as many of the disadvantaged children you will be helping would love the privilege of choice that we take for granted every day!! The overwhelming sense of achievement, at not only finishing the race in a good time (from a selfish perspective) but knowing I had worked just as hard at raising money for this great cause gave me such pleasure that I don’t think I would have experienced had I just done it for my own gain. I was grinning non-stop for a week afterwards! 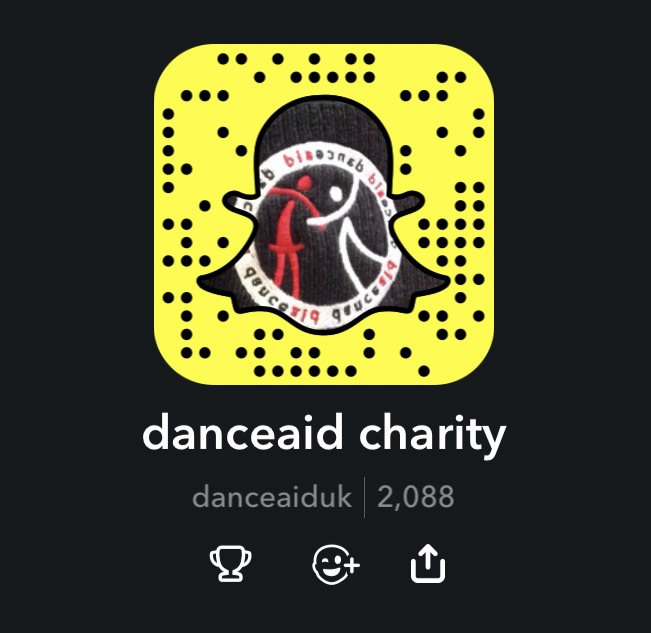 Every subsequent ache and pain I have had that has brought a satisfying smile to my face since the event serves as proof that danceaid’s mission to turn suffering into smiles is a very real ambition that we can all help them achieve by doing our bit. I will personally be continuing to support this great charity in the future and am working on my next challenge as I write this account.